PepsiCo CEO Indra Nooyi will step down on October 3 after continuing at the helm of food and beverage multinational for 12 years. PepsiCo CEO Indra Nooyi will step down on October 3 after a 12-year stint at the helm of food and beverage multinational. The 62-year-old India-born executive has spent 24 years at PepsiCo. The company announced that its Board of Directors has unanimously elected Ramon Laguarta to succeed Nooyi as Chief Executive Officer. However, Nooyi will remain Chairman until early 2019 to ensure a smooth and seamless transition. The 54-year-old Laguarta was also elected to the company's Board of Directors, effective October 3. 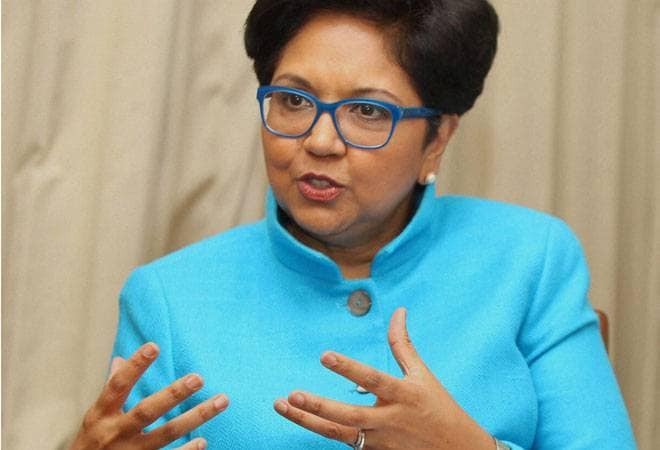 "Leading PepsiCo has truly been the honor of my lifetime, and I'm incredibly proud of all we have done over the past 12 years to advance the interests not only of shareholders, but all our stakeholders in the communities we serve," said Nooyi adding, "Growing up in India, I never imagined I'd have the opportunity to lead such an extraordinary company." Commenting on the appointment of Laguarta Nooyi said, "Ramon Laguarta is exactly the right person to build on our success. He is a terrific executive with a long and proven track record of growing businesses. He has a deep understanding of the changing preferences of consumers and other critical trends unfolding around the world, and he has demonstrated that he knows how to navigate them successfully. Ramon has been a critical partner in running the company, and I'm confident he will take PepsiCo to new and greater heights in the years to come." Under Nooyi's leadership, PepsiCo's revenue grew more than 80 per cent, outperforming our peers and adding a new billion-dollar brand almost every other year. According to PepsiCo's Presiding Director Ian Cook, PepsiCo shareholders have benefited during Nooyi's tenure. "$1,000 invested in PepsiCo in 2006 is worth more than two-and-a-half times that amount today," Cook said. "Today is a day of mixed emotions for me. This company has been my life for nearly a quarter century and part of my heart will always remain here. But I am proud of all we've done to position PepsiCo for success, confident that Ramon and his senior leadership team will continue prudently balancing short-term and long-term priorities, and excited for all the great things that are in store for this company. PepsiCo's best days are still ahead of it," added Nooyi.